Having lived in Massachusetts my whole life, I tend to feel a pull towards movies and television shows that take place in New England. They aren't my favorite, per se, but they sure do add an extra element. Perhaps that element is familiarity or representation. Regardless, I decided to compile a list of great movies and binge-worthy television shows that are set in New England. I've been watching "American Horror Story" since Murder House (season 1) first aired in 2011. Currently, my roommate and I have been watching it together and are on Hotel (season 5). The premise of the series is that each season features a new storyline, new characters, and new settings. Somehow the seasons connect but you'll have to watch to find out how. Asylum is the second season which follows the inmates and staff of a fictional mental institution, Briarcliff Manor, in Massachusetts. It jumps from the past (1964) to the present. Oh, and there are aliens? Can you tell I love Jessica Lange? Taking place in the New England tourist town of Amity Island, the police chief, Martin Brody, has to face the Mayor, Larry Vaughn, in closing down the beaches (which brings in all the revenue) to take down a killer shark. With the help of an Ichthyologist and a ship captain, Brody engages in the epic battle of man vs. nature. I mean, come on, who doesn't love a good old mechanical shark? On an island, New Penzance, off the coast of New England, twelve-year-olds Sam and Suzy fall in love and decide to run away. With a violent storm approaching, a group of quirky adults puts together a search party before disaster strikes. If you like weird and different, this is the movie for you. 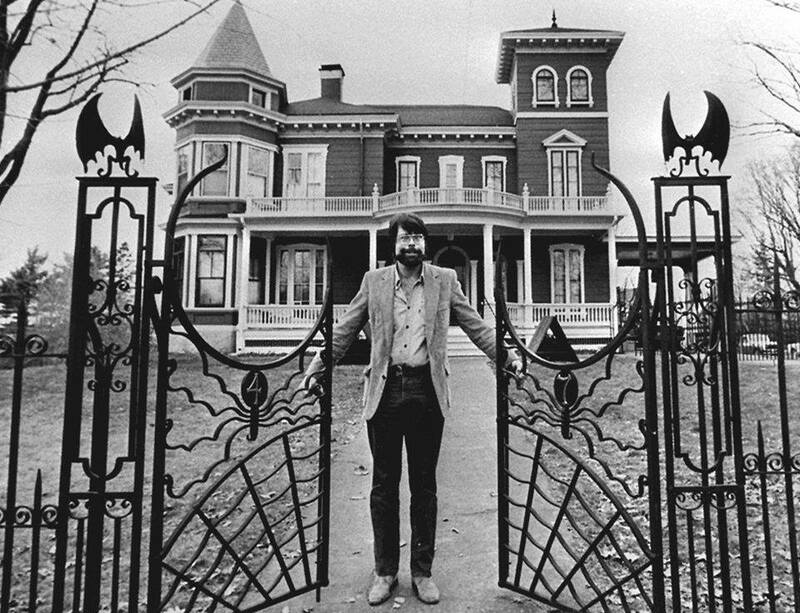 Stephen King tends to write stories that take place in Maine, where he resides with his wife and dog in a red gothic house with amazing gates. I mean, just look at him. Anyways, a lot of his books have been turned into movies, but the most recent is his epic "It". As a huge Stephen King nerd, I was pretty happy with the adaptation. Taking a book of over 1,000 pages and making it into a movie (two movies) is going to be difficult regardless, but I thought they did a pretty good job. However, it was definitely not as scary as the book. I digress. "It" follows seven outcasts who team up in friendship and love to defeat an evil "clown" in their town of Derry, Maine. Matt Damon, Ben Afflleck and Robin Williams, what else could you want? This movie follows Will (Damon), the MIT janitor with a genius-level IQ whose talents are discovered by one of the professors who decides to help Will reach his full potential. However, Will is arrested for assaulting a police officer and the professor makes a deal for him to see a therapist (Robin Williams). Elle Woods wanted nothing more than to marry her boyfriend Warner, but he wasn't in it for the long haul because she was too blond. Feeling defeated, Elle rallies and pulls all her resources to follow him, getting into Harvard Law (what? Like its hard? ), and totally acing it proving that her blondness doesn't hold her back but, in fact, helps her succeed. A group of camp counselors on the last day of summer camp each try to complete their unfinished business before the day is through. The pent-up sexual frustration, stress, soon separation and the talent show all hold great weight in the minds (and groins) of the counselors and campers. A time capsule is dug up fifty years after its original burial and a cryptic document is pulled out by a student whose father (Nicolas Cage) decodes the message only to realize that it is a list of every major disaster from the past five decades that also predicts three more that are about to happen (one being a global cataclysm). Denzel Washington thought he put his past behind him and tried to create a new quite life, but befriends a prostitute teenager who was abused by Russian mobsters and comes back with a vengeance to take anyone down who brutalizes the helpless. Jesse Eisenberg has a laundry list of tasks he has to do before he can attend an important audition. Checking his mother into rehab being one of them, takes longer than expected when she isn't accepted and he has to score her drugs so they'll take her and her tainted urine. The list of movies and t.v shows that take place in New England goes on and on (how many times did they remake/adapt "The Scarlet Letter"?) However, these are just some of my favorites!